Every rug cleaning question you have, answered. As much as we love the convenience and price point of big box retailers, there’s something about the innate charm antique pieces carry that just can’t be replicated. Case in point: Antique and vintage rugs, which are the easiest way to simultaneously warm up a room and add character to a space. The only issue? Being that these handmade, older carpets are frequently one-of-a-kind or sourced internationally, caring for them can seem like a daunting task. 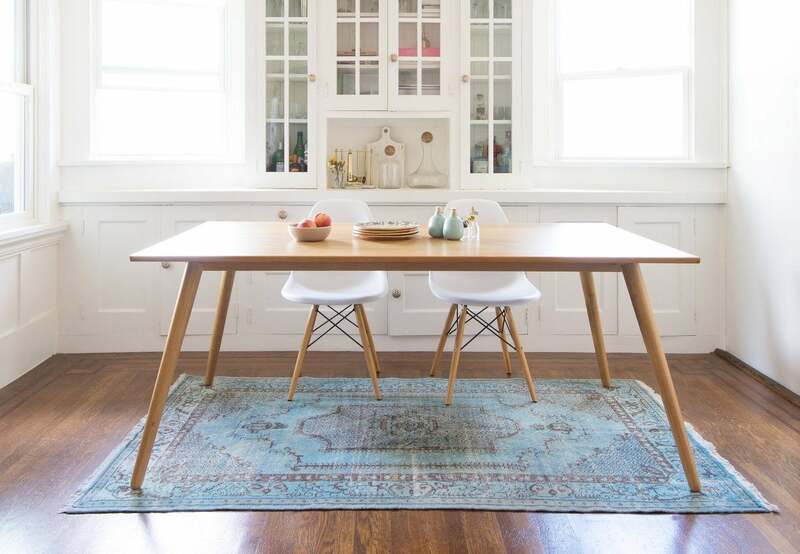 After all, they’re not so easy to replace, which is why we tapped the experts over at Revival Rugs—the first direct-to-consumer vintage rug company—to get the intel on all things rug care. The four Revival Rugs co-founders started the company out of frustration with a lack of transparency in the rug industry. By partnering with local artisans and vendors in Turkey, they cut out the middleman to produce authentic, quality rugs at prices that are actually feasible. With a vast arsenal of products ranging from vintage distressed rugs to kilim cushions (with an average price point of $400), we figured the founders of Revival Rugs would be up to the task of outlining everything we need to know about cleaning and caring for various types of rugs. And they definitely were: Read on to get all your vintage and antique carpet questions answered. Are there certain rug materials that work best for outdoors? When it comes to selecting an outdoor rug, you want to go with something durable enough to handle different weather conditions. Wool is as indestructible as rug materials come, so it holds up well in high traffic areas—and with the right kind of care, [it] can last for generations. Many of these rugs were originally intended for nomadic use, so they are, by origin, outdoor rugs. If you’re living in a very dry climate or using the rug as a temporary accent, then a wool rug is certainly durable enough for outdoor use, and it also creates a beautiful backdrop for weddings, events, and entertaining. However, wool and moisture don’t get along, so if you’re looking for something more long-term for an outdoor space, I would recommend hemp. Like wool, it’s a super durable, all-natural fiber, and because hemp rugs are flatwoven, they dry quickly. How often do you recommend cleaning your rugs? Quality vintage rugs don’t require a lot of maintenance. They don’t shed like new rugs, so it’s a more common mistake to over-vacuum than it is to not vacuum enough. You really only need to vacuum your rug once or twice a month, and every few months, flip the rug over and vacuum the backside. Try to avoid using a rotary vacuum, as that can wear down the fibers of the rug. Instead, use the suction attachment, vacuuming side-to-side instead of fringe-to-fringe in order to avoid destroying the fringe finish. A good way to know when your rug needs to be professionally cleaned is by beating a section of the rug. If you see dust clouds, it’s time to get your rug professionally cleaned. This will typically be every three to five years. Is cleaning different for vintage rugs versus newer rugs? It depends on how the rug was made. New rugs are manufactured using a range of techniques like hand-tufting, which make the rugs disposable after five to 10 years of use (since the latex backing starts to wear away, and the rug starts to fall apart). It would cost more to try to salvage and clean [that] rug than to just buy a new one. If we’re talking about handwoven rugs, the process of cleaning a new and vintage rug is more or less the same. With new rugs, there’s an initial period of shedding that requires more vacuuming for the first few months. Do you recommend a store-bought solution, or can you make one at home? Technique and time are more important than the actual liquid solution. You have a 15-minute window before the stain starts to set, so you’ll want to deal with it ASAP. Ninety percent of spills can be resolved with clean, cold water, especially if you act immediately. Always blot. Never rub: That will just make the stain bigger. For stubborn stains, a store-bought solution that’s specific to wool rugs works just fine, but can be pricey. You can easily whip up cleaning solutions specific to the type of spill or stain you’re dealing with. For instance, use salt to absorb red wine spills, and then go in with a mild solution of eight parts water, one part white vinegar, and a very small squirt of mild dishwashing detergent to dab away the stain. How do you clean vintage rugs? Is there anything you need to be particularly careful about? Vintage rugs do not like moisture, so part of keeping them in good shape for years to come is leaving any sort of washing to the professionals. The only time you should be taking any liquid cleaner to your vintage rug is to spot clean a stain. Do not dry clean your rug. The solvents used will dry out the natural oils in the wool fibers, making them weak and brittle. 2. Don’t steam clean your rug. Think of the havoc heat wreaks on a wool sweater! Don’t vacuum on a high-suction setting. A gentle low suction is sufficient to get dirt and dust up out of the rug. Don’t use a rotary vacuum. The beater bars in a rotary vacuum pry into the carpet fibers by pulling on the rug, thereby loosening dirt more efficiently. While this may sound great, the result is actually increased shedding, possible damage to the wool fibers, and reduced rug life. It’s especially important to avoid vacuuming the fringes using a vacuum with a beater bar, as the bar will pull the fringes and may cause unevenness in the weave over time. It’s similar to what happens when a thread on your wool sweater gets caught on your nail! Don’t get your rug wet. The top layer of each wool strand is hydrophobic, meaning it repels water, but the bottom layer is hydrophilic, meaning it attracts and retains water. This means that if your rug becomes wet, it is very difficult to get it entirely dry on your own. And if the entire rug is wet, it’s nearly impossible to get the rug dry before mold and mildew start to develop. 6. Don’t put a plant on a vintage rug. When you water it, it actually traps moisture under the plant that can’t escape. This could lead to rug rot and mold growing. 7. Do get a rug pad. The less a rug is pulled around, the less the fibers are stretched and pulled to form holes. A rug pad keeps a rug firmly in place. After a deep clean, what’s the upkeep like for a vintage rug? One of the benefits of investing in a vintage, handwoven rug is that they’re low maintenance. Just vacuum one to two times a month (depending on how high traffic the area is), and then flip [it] over and vacuum the backside every few months. Also, a simple but important step you can take in ensuring even wear is rotating the direction of your rug. So, if a part of the rug is getting tread on more than an area partially covered by a table or couch, rotating it will make sure it’s more evenly exposed. It’s good to do this every six months to a year. Does cleaning vary by rug material? The process of vacuuming does not change for different materials, and the only difference in spot cleaning is that cotton, hemp, and goat hair rugs require a slightly higher ratio of detergent to water than wool rugs. For wool rugs, the formula is one part detergent to 100 parts water. For cotton, hemp, and goat hair rugs, doubling to two parts detergent to 100 parts water will yield better results. Do you clean an outdoor rug differently than an indoor rug? If you’re dealing with vintage rugs, no. The difference would be the frequency of cleaning the rug, since outdoor rugs will accumulate dust and dirt more quickly. So, they will need to be cleaned more frequently than indoor rugs.